When I grill a steak, how can I make sure it’s not tough? Also, I just got a meat smoker as a gift. What cuts of beef would be best for the smoker? Nothing is worse than grilling a steak, enjoying the aroma as it cooks, and then barely being able to cut through it with your best steak knife. The issue probably isn’t your skill on the grill. It’s most likely a bad match of cooking method and cut of beef. Lean cuts of beef — those with little marbling and external fat — are better suited to slow cooking methods, such as smoking. Slow cooking allows connective tissue and muscle fibers to break down. The process tenderizes what otherwise would be a tough chew. Those cuts are from the parts of the animal that work the hardest, the muscles used for walking and locomotion, which have little fat and the most connective tissue. Generally, those cuts are the round, which is at the hindquarters of the animal, and the chuck and brisket, which are at the front of the animal, from the shoulders to the chest. 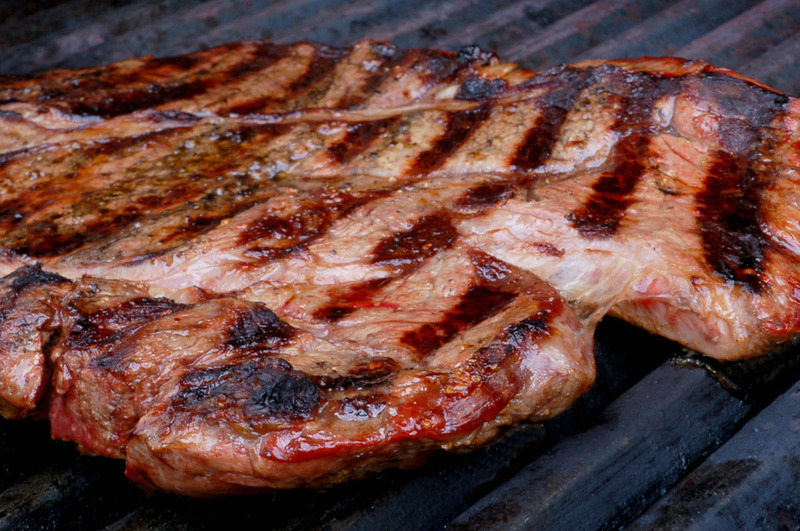 In between the round and the chuck are the “middle meats,” which are best for grilling. They tend to have a lot of marbling, which is the little white flecks of fat throughout a piece of meat. Generally, the more marbling in the meat, the more palatable it will be — flavorful, tender and juicy. The rib and short loin tend to have the most marbling. The sirloin, which offers lean, tender cuts of meat without much fat, is situated behind the short loin and in front of the round. Skirt steaks, which come from the middle part of the animal’s underside, found in the flank area, are good quick-skillet muscle cuts best used for fajitas, tacos and in salads. Whatever cut you choose, when the meat is done, let it cool slightly to let the juices settle, and always slice against the grain. That will break up the muscle grain into small pieces, which will make the meat less chewy. To see a short video to learn where various cuts of meat come from on a beef carcass, see Ohio State University Extension’s “Beef Cuts for Fast Grilling and Slow Smoking,” at go.osu.edu/beefcuts. Editor: This column was reviewed by Lyda Garcia, Ohio State University Extension meat specialist and assistant professor in The Ohio State University’s Department of Animal Sciences. Posted in Food	Tagged beef, grill, smoke, steak	Bookmark the permalink. Thank you very much for these useful tips on how to cut the meat. Every time I make a mistake in marking the cuts and my meat gets chewy. Thank you again for these tips. Will surely follow them next time while smoking meat.